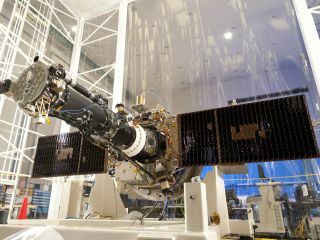 NASA's Interface Region Imaging Spectrograph (IRIS) with solar panels open in flight position, in the clean room at the Lockheed Martin Advanced Technology Center in Palo Alto, where it was designed and built. NASA will launch its newest solar observatory tonight (June 27), kicking off a two-year mission to study how energy moves around the active sun. A rocket carrying the Interface Region Imaging Spectrograph satellite, or IRIS, is scheduled to take off from California's Vandenberg Air Force Base at 9:27 p.m. EDT tonight (6:27 p.m. local time; 0127 GMT Friday) underneath a carrier aircraft. The plane will release its payload high above the Pacific Ocean one hour later, at which point the rocket will kick on and blast IRIS into orbit. You can watch NASA's IRIS solar obseratory launch live on SPACE.com courtesy of a NASA webcast. The webcast will begin at 9 p.m. EDT (0100 GMT) and be beamed out live via the space agency's NASA TV channels. "What we want to discover is what the basic physical processes are that transfer energy and material from the surface of the sun out to the outer atmosphere, to the corona," IRIS principal investigator Alan Title, a physicist at Lockheed Martin's Advanced Technology Center Solar and Astrophysics Laboratory in Palo Alto, Calif., told reporters earlier this month. "And remember, the corona extends throughout the heliosphere," Title added, referring to the huge bubble of charged particles the sun puffs out around itself. "We live in the sun's outer atmosphere." IRIS is part of NASA's Small Explorer program, which mounts missions for $120 million or less. The spacecraft is small, measuring just 7 feet long by 12 feet wide (2.1 by 3.7 meters) with its solar panels deployed. IRIS will launch to Earth orbit tonight aboard a Pegasus XL rocket, which is made by Virginia-based aerospace firm Orbital Sciences. A L-1011 carrier aircraft will drop the Pegasus at 10:27 p.m. EDT (7:27 p.m. local time; 0227 GMT). At that point, the rocket and spacecraft will be 39,000 feet (11,900 m) above the Pacific Ocean about 100 miles (160 kilometers) northwest of Vandenberg, NASA officials said. Once in orbit, IRIS will peer in ultraviolet light at a sliver of the sun between the solar surface and corona. A better knowledge of this interface region, which is just 3,000 to 6,000 miles (4,800 to 9,600 km) wide, could shed light on why temperatures jump from 10,000 degrees Fahrenheit (5,500 degrees Celsius) at the sun's surface to several million degrees in the corona, researchers said. While other NASA spacecraft such as the Solar Dynamics Observatory (SDO) look at the entire solar disk, IRIS will focus on just 1 percent of the sun at a time, mission team members said. "IRIS almost acts as a microscope to SDO's telescope," Jim Hall, IRIS mission manager for the Launch Services Program at NASA's Kennedy Space Center in Florida,said in a statement. "It's going to look in closely, and it's going to look at that specific [interface] region to see how the changes in matter and energy occur in this region. It's going to collectively bring us a more complete view of the sun." IRIS was originally slated to launch Wednesday (June 26), but a power outage across much of California's central coast Sunday night (June 23) knocked out some key components of Vandenberg's tracking and telemetry systems, causing a one-day delay. While IRIS team members would have preferred to get off the ground on time, they said the delay was oddly appropriate in a way. "We believe that some — maybe a lot — of power outages actually have a lot to do with solar activity. So the better we can understand the physics going on, the better we can understand the activity, the better that we can potentially predict and mitigate some of these problems," said Pete Worden, director of NASA's Ames Research Center in Moffett Field, Calif., which is responsible for IRIS mission operations and ground data systems. "So it was sort of, in some sense, unfortunate to delay the launch, but it's also fortuitous to highlight the importance of this mission," Worden told reporters Tuesday (June 24).